This time of year is typically the kick-off for parent tours, or those looking for fall enrollment. One of the many things I enjoy most while guiding new parents through our hallways is the opportunity to show off the works in our classroom. If they come at the right time, they even get to witness the beauty of a Montessori work cycle in motion. The families seem to be amazed at the pure quality of the Montessori materials, and how everything in the classroom is…real. 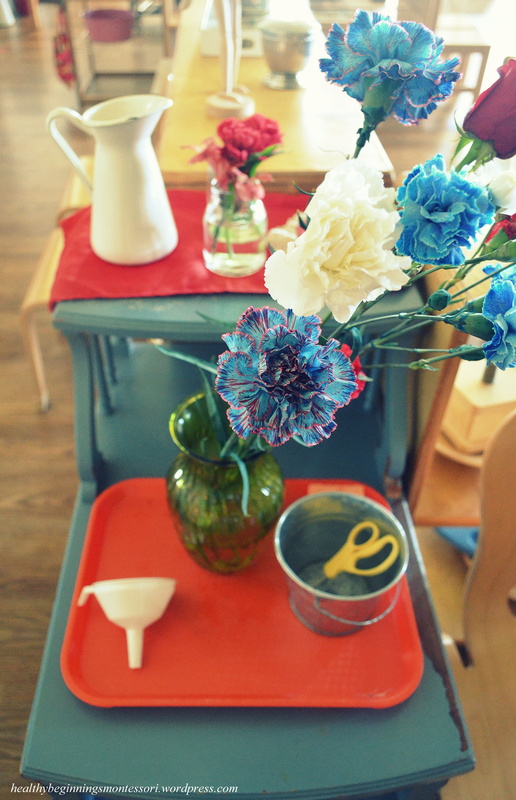 Montessori classrooms are beautiful. They resemble tiny living communities for the children, complete with authentic, real materials. It’s common for Montessori classrooms to have wood shelves, filled with wooden works. Porcelain pitchers in the practical life area. Glass cups and plates in the kitchen, and glass vases for flower arranging. The use of real materials shows the child that we respect their work; we want them to have “real life” experiences. We want them to learn to handle the materials with care, and to carry their bodies in a cautious manner. Montessori materials are absolutely beautiful. 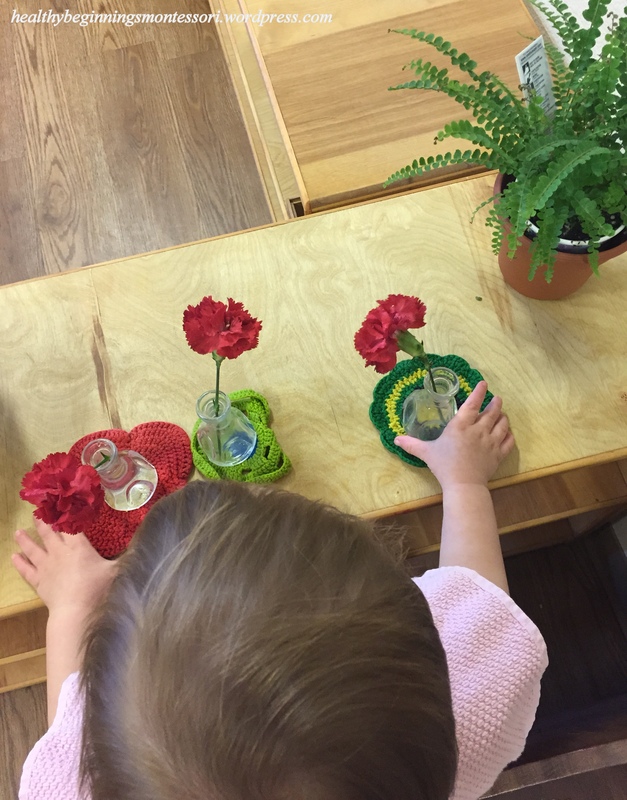 Each material was designed by Dr. Maria Montessori with a specific goal in mind, brought forth by observing the children, as they experimented with the works. She was a scientist, and spent many years creating, manipulating, and revising her works according to what worked best for the children. She understood human development, and developed a pedagogy based on just that. Montessori materials allow for the child to work independently and spontaneously, bringing forth a subconscious love of learning. Whether it’s at school or at home, the way you prepare your learning environment is the most important influence on how your child will learn. If it’s an environment well equipped with all the tools they need, including supplies to replenish the ones that are used, then surely they will succeed. If it’s an environment that has clutter, over-stimulating toys, “busy” colors on the wall, items that haven’t been restocked, etc, then you can more than likely expect the same learning experience for your child. The prepared environment is key to their academic success. Especially during their first 6 years of life (and after), a thoroughly prepared environment promotes organization, concentration, order, and an opportunity for the child to capitalize on their spontaneous sensitive periods of development. 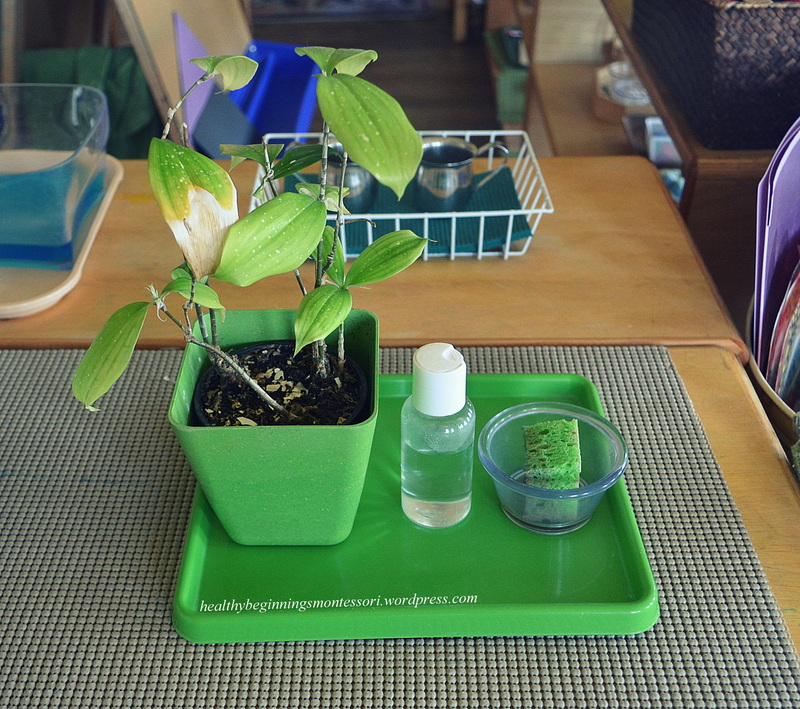 Simple and aesthetically pleasing, the leaf polishing work includes basic, clean and organized materials to help the child focus on the task at hand. 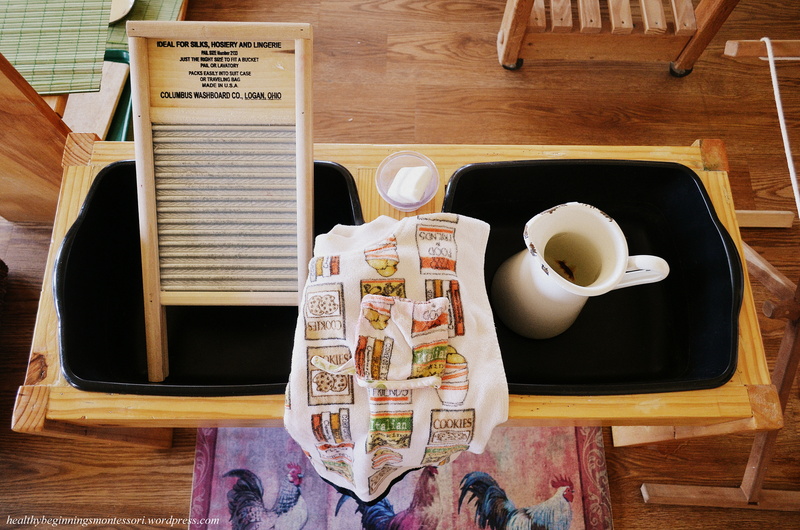 Clutter, or too many items on the tray, confuse and frustrate the child, blocking their creative energy. The most precious gift we can give our children is the opportunity to reach their fullest potential, by fostering an environment prepared to meet each of their learning needs. Children appreciate beauty and organization. The desire for beauty in the environment is not a luxury, it is a need for the child; a way for them to connect to the environment. Dr. Maria Montessori’s works were created with the intention of doing just that; to create materials so that they are beautiful and enticing to the child. She believed that objects should be fragile and beautiful. Children then learn to respect their surroundings by the way that they carry themselves, careful to not knock over or damage the objects around them. These things are precious and beautiful to the child; they are to be respected. Preparing your learning environment is an art, by implementing a layout that requires thought and careful movement from your little ones. Each item should serve a developmental purpose of some sort. Beauty refreshes the tired spirit. A classroom well-lit from natural light promotes beauty. Studies have shown that children who work in classrooms that have large, open windows are more successful than those who are kept in classrooms with no windows for the greater part of their academic career. Incorporating sunlight and nature as part of your child’s learning experience greatly enhances their spirit! The child’s sense of order is extremely essential in their overall success. Unless you’ve had the proper child development training, one often does not consider this factor as an important step in their learning process. Order is key. In order for a child to comfortably and confidently grow, they need to know that the learning material will always be in order and ready for them to use. Order gives the child a means of orienting themselves to their environment. Just as we expect everything to be where we last put it, children work much better if they know exactly where everything is, and that it will be in the same place every day. When a child finds himself in a beautiful, ordered environment, he will work to keep it that way. The cloth washing work is always available to the children, complete with all of the necessary tools needed to complete the task. An apron symbolizes that the child is doing important work, while keeping their clothes dry. The mitt is used for wiping up access water spills. The child is able to complete this work successfully because the guide has gently prepared all of the items in advance. 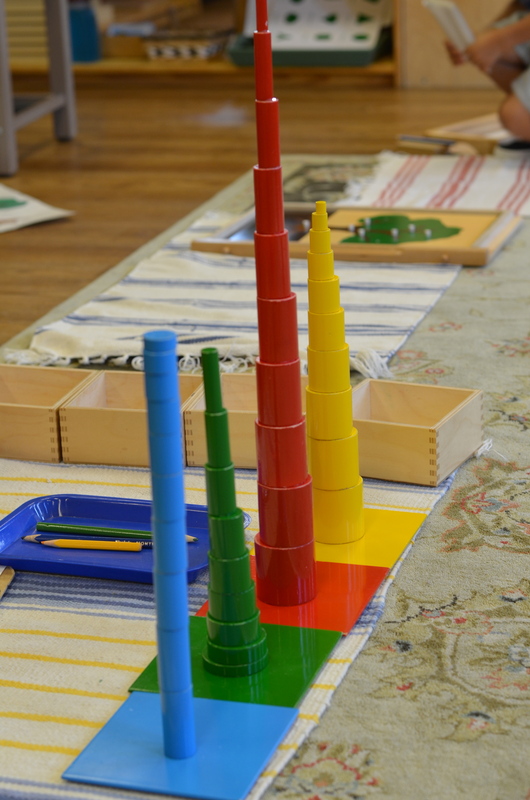 The beauty in Montessori is that it focuses on simplicity and order. Everything in the classroom environment, down to the finest detail, is prepared well in advance with the intention that it will be used to enhance a specific aspect of the child’s development. When preparing your classroom or home learning environment, take the time to quietly sit in silence for a few moments. How do you feel? Is the room inviting, comfortable, soothing? Are there interesting works that will capture the child’s attention? Is each work and activity prepared so that the child does not need to rely on you for help if they run out of something? Is there sufficient table and floor space for working? Try to look at the room from the child’s perspective, and prepare it in such a way that they can work with little to no assistance from the adult.